Grand Avenue was busy that day I ate lunch at Gammy's Cafe. But I suppose it's always busy. Looking out towards it from one of their concrete picnic tables, I saw truck after truck roaring past. Trailing every rig was the rumble of diesel engines, whirring of gears, smoke and dust. Above my head, a speaker blasted Mexican ranchera music at an ear-piercing volume. Together, the noise of the road and the polka-beat combined into a crazy, cacophonous soundtrack. Suddenly midway through my meal, a thunderous bang and deafening crunch jolted me half bite. I looked up and saw that a car had just plowed into another. A woman stormed out of one vehicle with a cell phone clutched to her ear. She hunched down to survey the damage to her rear bumper. It's dented, but the car that hit her fared far worse. Its driver, a guy with a beard, had already begun picking up pieces of his front end from the road when the woman started yelling at him. "They should get off the street," I thought as I gulped down the mouthful of taco I was still chewing. They did eventually, turning into a nearby strip mall to swap insurance information, but not before snarling the rest of the traffic on this four lane thoroughfare to a halt. This kind of thing must happen a lot in front of Gammy's. But nothing seems to faze the gentleman who greets you inside. He's got a cheery disposition and warmness that immediately disarms people. The guy is nothing but smiles and good manners. And why not? His tiny, roadside taqueria -- although surrounded by the uglyness of traffic, chaos and noise -- is a refuge. Jugs of cold agua frescas sweat in the corner. A modest salsa bar chills in another. The smells of the kitchen wafts through the air. And before he hands you your plate of tacos, he thoughtfully adds some pickled carrots, wedges of lime and chips, free of charge. The pastor taco I had featured chunks of pork, mired a caustic-looking red-pepper sauce that seems like it should be bolder and spicier than it is. Though by contrast, the chicken taco is still milder. They are wrapped in two floppy rounds of tortilla, which is thicker and pillowier than most. 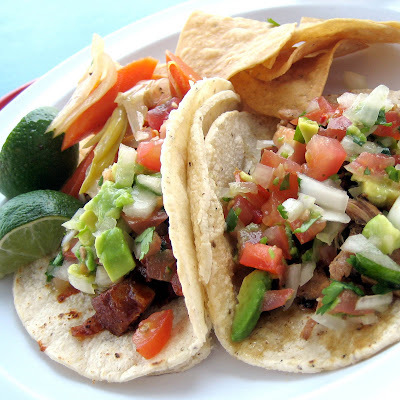 All are topped with pico de gallo and small bits of creamy avocado -- a nice touch, especially for a taco that costs only $1.40. Full and satisfied, I got in my car and said a little prayer before I lurched back onto the road. Before long, a semi-truck was hard on my tail, belching and throttling its engines all the way to the 5 on-ramp. i love authentic ghetto mexican tacos. I must try this place! This is just the tip of the iceberg. So much more out there. While the tacos are good, I'd say don't go if it's out of your way. Though the guy truly is the friendliest bloke you'll ever encounter in a taqueria. They have great Pork as well as Corn Tamales. Worth going back for. Jeezus man, your writing used to be so much better before you wrote for the OC Weekly. What's with all the fluff? I have to agree with Ron. Lately the posts have been so over written. On this article the first 7 paragraphs are totally unnecessary. Keep it simple and relevant like you used to do. I get lost in all the imagery you are trying to write about and its so unrelated. A simple "This place is next to a busy street so its loud" would have been sufficent. From that post, its still hard to tell if it was good, just visual and not that good, etc. Excellent! Will have to check it out. I loves me some tamales. I laughed (and am still smiling) when I read your comments. This is why I love blogging as a medium! I get instant feedback when I'm SUCKING, and occasional compliments when I'm not sucking as much. I had a feeling I was long winded on this one. I just realized there's only one paragraph about the food! You're right. I need to K.I.S.S. (Keep It Simple Stupid). But I'm curious: which of my past blog posts did you like? I want to know which post, specifically, I did right in the past -- so that I can recalibrate. My question is open to all who is reading this. Seriously, if I need to be set straight, I'd rather hear it from you guys, my readers, and not angry OC Weekly letter writers! Felt like I was having some industrious tacos for lunch today. here is an example of a post that was more to the point and described the food and the TASTE of things. I just don't like it when you get into all the imagery that you are trying to paint lately in your posts and all the unnecessary big words and references to irrelevant things. . Unless it really helps you determine things about the food. This might do the trick! If you don't mind the traffic and noise. Ah, yes. El Gallo Giro's torta and Noodle Avenue. I was pretty happy about how those posts turned out. It's no accident that I also LOVED those meals. I still get it all the time! Screw all of you: Elmo Monster RAWWWWWWWWWWKS! Your first few paragraphs had nothing to do with food, true. But it was still great writing, and I don't mind that you are trying to paint a picture of the surroundings. And it's tough to write about a place you don't necessarily like. Thanks for having my back Marvin! It's true what you say though. It's easy to lavish praise on a place you love, or demolish one you hate...but when it's somewhere it between, it's damned difficult. I went ahead and wrote this one up because I really did like the guy's hospitality. And also, that accident was somewhat interesting! At least to me. that looks SOOOOOOOOOO good from taipei. went to get some mexican food recently and had the worst service. I've always loved your blog and frankly you inspired my measly one. I kind of agree that the food needs to be more of a focus than it has been lately. That said, you set the bar for OC Food blogging and do not go away. 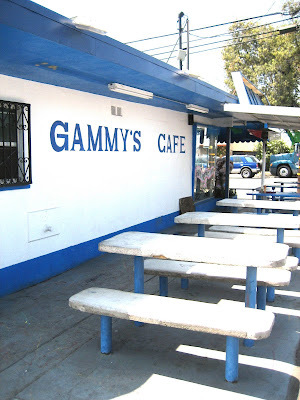 I went to Gammy's about 6 months ago for the first and last time. Only because I live in So. OC and never get there. One great thing they have are the blackened mushroom tacos eerily similar to Taco Loco in Laguna yet 30% of the cost. Needless to say I loved them. Good service goes a long way doesn't it? Thanks for the vote of confidence! I had no idea I inspired your blog (which you really should start up again). Had you posted about the mushroom tacos I wouldn't have missed them! Dang! Late to the party here, but I just wanted to say I liked this post! Part of the experience of eating out is absorbing the atmosphere of a place, and you really captured that here. Keep up the great work, Elmo. Thanks A! The atmosphere *WAS* a large part of the experience. With my lunch, I got a show! Part of any dining experience is the ambience. And having been to Gammy's, I can tell you the description of the traffic is spot on. I like that you set the scene. Thanks Jill! I'm glad to know that my description is consistent with your experience. Also, sometimes, it's just fun for me to write about something other than *just* the food. I have to agree with the criticism of Anonymous and Ron here as to why this piece of writing failed with regards to food criticism. The part about the food seemed to be tacked on at the end, almost an afterthought. One shouldn't have to read the comments afterwards to discern what the writer really thought about the food. After reading some of these comments, I think some readers end up misinterpreting what Elmo thinks of the place. Maybe its the writer's fault or the readers' fault, but if there were more focus on the food, would this still be a problem? I was in Santa Ana last week, and only a couple of miles away. But, even then, it really wasn't worth the drive to get there. If we were in Iowa, then maybe I could understand why this place was singled out. But, to get there, I probably passed by a number of superior joints in Santa Ana. Don't bother driving there to get blackened mushroom tacos cause they don't even have those. I've eaten my way through my fair share of hole in the walls where communication was difficult and where sanitation probably wasn't that big of a concern, but if the food is worth it, then I don't mind. This place didn't pass that test.